Westerners and Muslims generally agree that relations between them are poor. On balance, the Western publics polled tend to say relations are bad, and the same is true among the Muslim publics in the survey, with the exception of Indonesia, where views are divided. However, Westerners are less likely to believe relations are poor today than was the case five years ago. Negative assessments have become less common since 2006 in Russia, Britain, Germany, the U.S. and France. Overall, there is no improvement, however, in predominantly Muslim nations, where assessments are at least as negative as they were five years ago. Again, the only exception is Indonesia, where fewer now say relations between Westerners and Muslims are bad. While Westerners and Muslims generally agree that relations between them are not good, they largely disagree over whom to blame. Many Westerners think Muslims are at fault, although a substantial number believe that Westerners themselves share at least some of the blame. Meanwhile, Muslims – and in most countries, large majorities of Muslims – blame Westerners. Similarly, while both sides agree that Muslim nations are not as prosperous as they should be, they differ over the reasons why. In particular, many Muslims blame the policies of the U.S. and other Western countries, while few in the West take this position. However, government corruption in Muslim nations is considered a primary cause by Muslims and Westerners alike. And since 2006, several Muslim and Western publics have become more likely to blame the lack of prosperity in Muslim countries on a lack of democracy in these countries. Many Muslims continue to believe both Americans and Europeans are hostile toward them, and in several nations this perception has become more pervasive over the last five years. For their part, Americans and Europeans continue to believe that Muslims in the West want to remain distinct from the rest of society. There is no Western country in which a majority says their country’s Muslim minority wants to adopt the customs of the broader society. Among Western nations, assessments of Muslim-Western relations are especially negative in France, Germany and Spain. In all three countries, roughly six-in-ten say relations between Muslims and people in Western nations such as the United States and Europe are poor. Somewhat fewer in Britain (52%) and the U.S. (48%) hold this view. The percentage of Russians describing relations as bad has fallen 15 points since 2006, and notable declines have also taken place in Britain (-9 points), Germany (-9), the U.S. (-7), and France (-4). Of all the publics surveyed, Palestinian Muslims offer the most negative assessments of Muslim-Western relations (72% bad), although roughly six-in-ten Muslims in Turkey, Lebanon, Egypt and Jordan feel this way. Only 45% of Pakistani Muslims say relations are bad, although this is up from 25% in 2006; 8% say relations are neither good nor bad and fully 29% have no opinion on this question. Indonesia is the exception among the Muslim publics surveyed. Just 41% of Indonesian Muslims say relations are bad, down from 54% five years ago; 43% currently believe relations between Muslims are Westerners are good. When Westerners who characterize relations as bad are asked who is responsible, they tend to say Muslims. This is especially true in France, where 56% of those describing relations as poor place most of the blame on Muslims. About half in Spain (49%) blame Muslims, up from 32% five years ago. Roughly half (48%) also hold this view in Germany. About four-in-ten Russians (41%) who think relations are bad primarily blame Muslims. Somewhat fewer express this opinion in Britain (34%). While 40% of Americans who describe relations as bad blame Muslims, this view is much more common among Republicans (60%) than Democrats (33%) or independents (32%). Many Westerners hold their own countries responsible. More than one-quarter in the U.S. (29%), Russia (27%), France (26%), and Britain (26%) place most of the blame on people in Western countries. In Spain (29%), Germany (24%), and Britain (24%) many volunteer that both sides share responsibility for the poor state of relations. 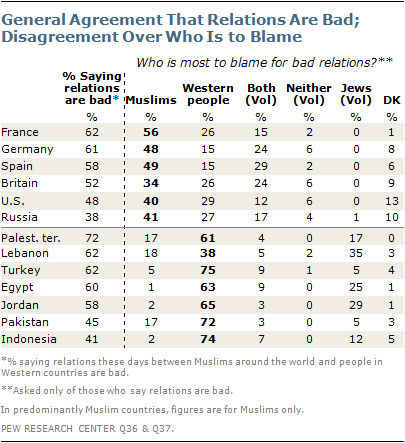 Among Muslims who say relations are bad, majorities in six of seven nations think Westerners are mostly to blame. This view is especially common in the non-Arab nations surveyed: Turkey (75%), Indonesia (74%), and Pakistan (72%). In the four Arab nations, significant minorities volunteer that Jews are primarily to blame, including 35% of Lebanese Muslims. Across the Muslim publics included in the survey, fewer than one-in-five believe Muslims are mostly to blame for the poor state of relations. Should Muslim Nations Be More Prosperous? In 12 of 14 countries, majorities say that, all things considered, Muslim nations should be more prosperous than they are today. More than three-quarters hold this view in Spain (86%) and France (76%), as do 60% in Germany and 59% in Britain. A slim 52%-majority of Americans think Muslim countries should be wealthier. Views are more divided in Russia, where 37% say they should be more prosperous, 31% say they should not, and 32% give no opinion. In Israel, views are sharply divided along religious lines – just 44% of Jews believe Muslim nations should be more prosperous, compared with 88% of the country’s Muslims. Among the predominantly Muslim publics surveyed, there is an overwhelming consensus that the Muslim world should be better off economically than it is today. At least eight-in-ten Muslims express this opinion in all seven of these countries. Across the 14 countries where this question was asked, those who think Muslim nations should be more prosperous point to a variety of causes for these economic troubles. Americans and Europeans tend to say government corruption is a major cause – majorities in the U.S. and all four Western European nations name this as one of the top two reasons why Muslim nations are not more successful economically. 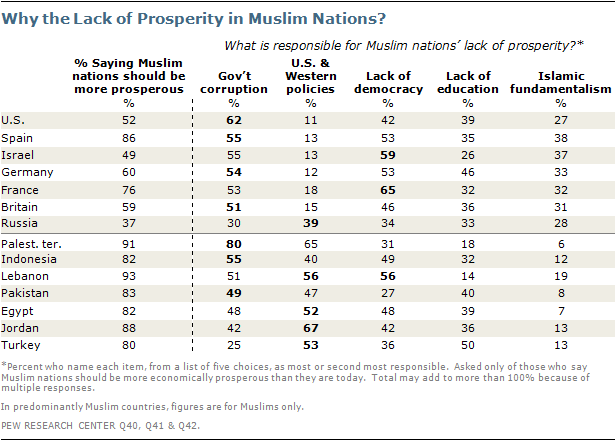 Many Americans and Europeans also say that Muslim nations’ economic difficulties stem from a lack of democracy. This is a particularly common view in France, where 65% of those who believe Muslim nations should be richer say that a lack of democracy is one of the top two reasons for their economic problems, up from 48% in 2006. This view has also become much more prevalent over the last five years in Germany (+25 percentage points), Spain (+19), Britain (+14), and the U.S. (+14). In contrast, the percentage of Westerners blaming Islamic fundamentalism for the economic challenges in Muslim nations has declined over the last five years in most countries, with notable drops in Germany (-20 percentage points), Russia (-13) and France (-11). Drops have been more modest in the U.S. (-5) and Spain (-4). Relatively few in the U.S. or Western Europe think American and Western policies are responsible for the lack of prosperity in the Muslim world. However, roughly four-in-ten Russians (39%) list this as one of their top two reasons. Placing blame on U.S. and Western European policies is also quite common among the Muslim publics surveyed. This is especially true in Jordan – a country with close diplomatic ties to the U.S. – where two-thirds list American and Western policies as one of top two reasons for the lack of prosperity in Muslim countries. In Pakistan, the percentage of Muslims voicing this opinion has almost doubled since 2006 (47% vs. 24%). Muslims also believe corrupt governments are to blame. Eight-in-ten Palestinian Muslims say official corruption is one of the top two reasons for the lack of prosperity. Nearly as many Israeli Muslims (76%) hold this view, compared with 49% of Israeli Jews (Jews in Israel tend to mention a lack of democracy – 60% list it as a top reason). Many Muslims also cite a dearth of democracy, including a majority (56%) in Lebanon. And as is the case among Westerners, Muslims are more likely to believe this today than they were five years ago. Notably, more now express this view in Egypt, which itself is in the process of transitioning to democracy (48% now; 32% in 2006). This view has also become more common in Indonesia (+14 percentage points) and Jordan (+14). Significant numbers of Turkish (50%), Pakistani (40%), and Egyptian (39%) Muslims say a lack of education is responsible for the economic problems of Muslim nations. There is no Muslim public in which as many as one-in-five name Islamic fundamentalism as one of the primary reasons. Muslims continue to believe there is widespread hostility toward them in the West. More than seven-in-ten think most or many Americans are hostile toward Muslims in the Palestinian territories, Turkey, and Pakistan, and solid majorities feel this way in Egypt and Jordan. Moreover, perceptions of American hostility have increased since 2006 in four of the five countries where trends are available, with the percentage describing Americans as hostile rising 11 percentage points in Turkey and Pakistan, six points in Egypt, and five in Jordan. Roughly six-in-ten Lebanese Muslims (59%) also hold this view, although there is a large gap between the country’s Shia (69%) and Sunni (49%) communities on this question. Slightly more Israeli Muslims believe just some or very few Americans are hostile toward Muslims than hold the opposite views (52% just some/very few; 47% most/many). Somewhat more Indonesian Muslims view the West as non-hostile on balance (50% just some/very few; 42% most/many). Overall, Muslims’ perceptions of Europeans are very similar to their perceptions of Americans on this issue, although Egyptian Muslims are more likely to see Europeans as hostile than to feel this way about Americans. 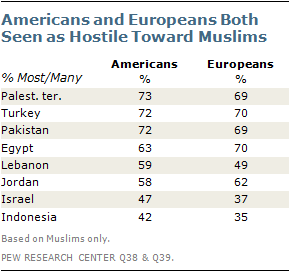 Conversely, Israeli Muslims consider Americans more hostile than Europeans, as do Lebanese Muslims. In particular, Lebanese Shia believe Americans are more hostile than Europeans (69% vs. 55%). The view that Europeans are hostile has become more common since 2006 in Turkey (+13 percentage points), Jordan (+11), Egypt (+7), and Pakistan (+7). On balance, respondents in the non-Muslim nations surveyed believe Muslims in their countries want to be distinct from the larger society. Majorities or pluralities hold this view in Western Europe, the U.S., Israel and Russia. This opinion is particularly widespread in Germany (72%), Spain (69%), and Russia (66%). 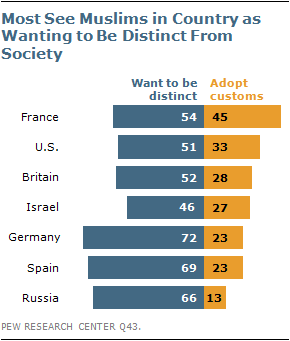 France is the country in which the largest percentage believes Muslims want to adopt national customs: 45% think French Muslims want to embrace the French way of life. Across the U.S. and Western Europe there is a notable education gap on this question. Consistently, the opinion that Muslims do not want to assimilate is less widespread among those with a college degree. The largest gap is in France where 42% of those with a college degree say Muslims wish to be distinct from the rest of society, compared with 62% among those who do not have a college degree. Double digit differences also exist in Germany, Britain and the U.S.